The man came yesterday afternoon and put it together. By the time I got home, it was done. I suppose I could have done it myself, but there are stories online about it being a mind-boggling puzzle. Even the greenhouse company said it would take me two days. They have a list of recommended people who build them, and the man charged £160. It took him about four hours. It did mean drilling into the concrete, so it's not quite the same as an Ikea bookcase. And I must say I think it looks really good. It fits in nicely and is big enough inside without dominating the garden. The only problem is that one piece of glass was missing. The man told the company and they say they'll deliver it next week. So we have a small hole in the roof for the moment. 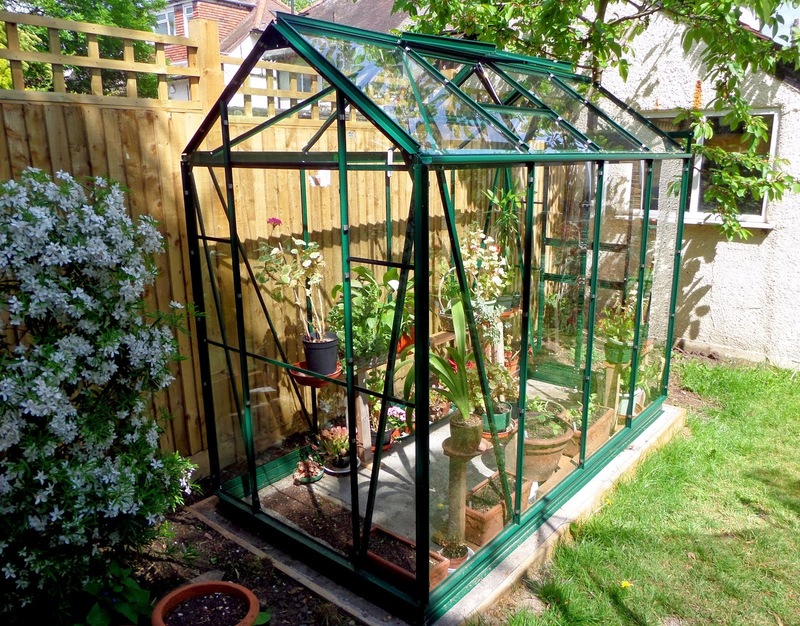 It cost £600 including delivery and a self-opening window (for when it gets too hot inside). That was on a special offer, but here are the product details. The people from the company, the Greenhouse People, who I spoke to on the phone were friendly and knowledgeable and willing to discuss all the details about the concrete base and other things I wanted to check on. Even the man who delivered it (and five other greenhouses on his round trip to London from Stoke-on-Trent) was very pleasant.